3. Do not expose this product in high temperature locations, such as confined car exposed to strong direct sunlight, control panel and other overheating places. LIGHT AND THIN: PC+ABS fire-resistance material, Exquisitely design of 1.15 lb , easy to take for both outdoor and indoor studio photographing. 192PCS ULTRA-BRIGHT LED BULDS: With 192 individual LED long lasting bulbs, this light provides wider lighting range and illuminates. 2 COLOR FILTERS,white, brown, to meet different lighting needs. 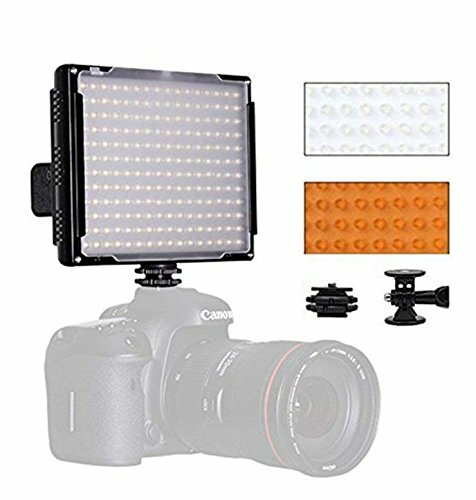 UNIVERSAL USE: The LED light can mount to any standard hot shoe on most DSLR or digital video cameras, tripods and light stands. PACKAGE INCLUDED: 1pcs * DL-918 Main Body ; 2pcs*Color Filter(1*white, 1*brown); 1pcs*User Manual. Pls note that the battery is not included in the package,thanks.